Momentum with ties to technology, infers how improving one’s health is associated with positive inertia and change. We seek to allow people to unleash their potential by fusing technology and the human machine to live the way life is meant to be—simple and without limits. Momentec Fitness is transforming the fitness industry through innovation and technology that improves performance, recovery, injury prevention and rehabilitation. Technology is the new frontier in fitness. We are finding ways to make the tools and technology used by elite competitors accessible to the everyday athlete. We believe that recovery from training hard is as important as the training itself. 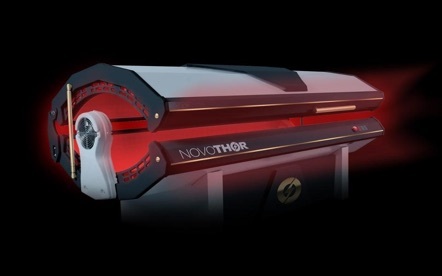 The NovoTHOR is a whole body delivery system of PBM Therapy that has been designed to deliver optimal wavelengths, power densities and dosages based on published clinical research outcomes. The NovoTHOR is safe, relaxing and has no negative side effects. Clients are supplied with safety goggles and then relax into the NovoTHOR treatment pod for 8 - 15 minutes of whole-body restorative light treatment. The treatment may be repeated two or more times a week. Your body is made up of cells. Within every cell energy is produced. Whenever energy is produced, it leaves waste that gets cleared from the body …under normal circumstances. However, when the body works harder, more energy is needed and more waste is produced. For various reasons, - illness, exercise, lack of sleep, etc. – sometimes, the cells are not able to keep up. The build up of a waste product called nitric oxide leads to a condition called oxidative stress. Research shows that oxidative stress can lead to chronic inflammation, which contributes to diseases. PBM reduces oxidative stress at the cellular level when the correct wavelength and intensity is applied to the cells, it displaces nitric oxide , ultimately removing the oxidative stress and triggering a downstream cellular cascade that stimulates the repair process. The advantage of the NovoTHOR is it works on the whole body in just 8-15 minutes. The intended uses of the NovoTHOR are to redevelop muscles, or restore motion to joints, or for use as an adjunct treatment for obesity. Powered by Chancelor Tech, LLC.